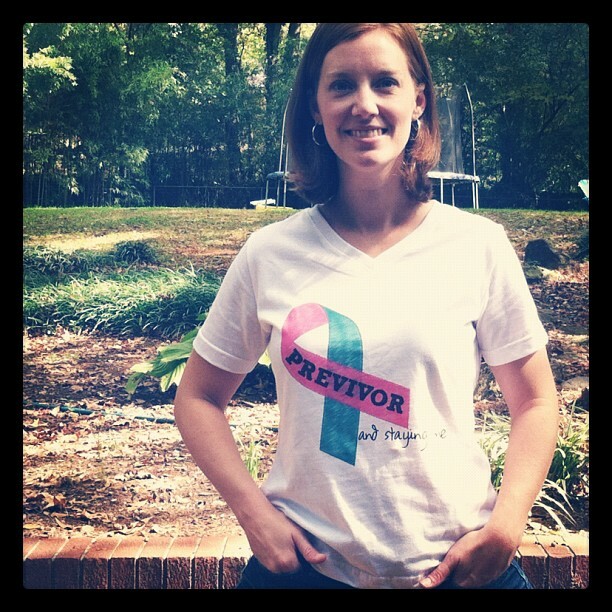 Previvor: A previvor is a survivor of a predisposition to cancer. I am a previvor. Many of us are in fact. I’m just one who actually found out what kind of cancer was lurking at my door and I am blessed to have been able to battle it on my own time table instead of it knocking at my door. For me, that would be breast cancer and ovarian cancer. My breast cancer causing mammary tissue is long gone…my mysterious ovaries are still intact. I am still ON the journey. Why do I need a term like this to show that I don’t have cancer? To me it’s a unifying thing. At the closing cermonies of the 3 Day event everyone gets a tshirt to wear. Last year everyone got a grey shirt but the survivors…they got pink shirts. I have seen the survivors at the end of the 3 Day event all wearing their pink shirts. From my perspective it’s a badge of honor. They have beaten or are fighting a battle. They look around and connect with the other survivors. You see women who are old and you see women who are young. No other day do they walk around labeling themselves as survivors. They give honor to the survivors. It’s really quite hard for me to explain the depth of emotion I felt when seeing this. I imagine if all the previvors were given a tshirt it would feel the same way. I would be drawn to them. You better believe I would run and give them a hug and say “I am your sister”. I don’t think I need to be labeled every day. I do realize that there are so many people I encounter every day who are predisposed to cancer of all sorts. It’s overwhelming for me to wrap my brain around those facts. What I DO know is that even here in Athens, GA there are other previvors. I can think of several right now…some who are unsure what to do, some who are waiting for the right time and some who have already been active in eliminating their cancer risks. My mom began her course of action as a previvor but found out that cancer had already come knocking at her door. She will wear the pink shirt proudly at the closing ceremonies next weekend. I am grateful my mom is a smart and fearless woman who took action. I am grateful my mom will be around to wear the pink shirt of survival for many many more years. I know so many who are not so lucky. You sure look beautiful! Betcha those kids of yours are glad that you are a Previvor!!! Thank you Mary. If how I feel towards my mom is any indication of how my children will feel about my decision…then yes…very glad!